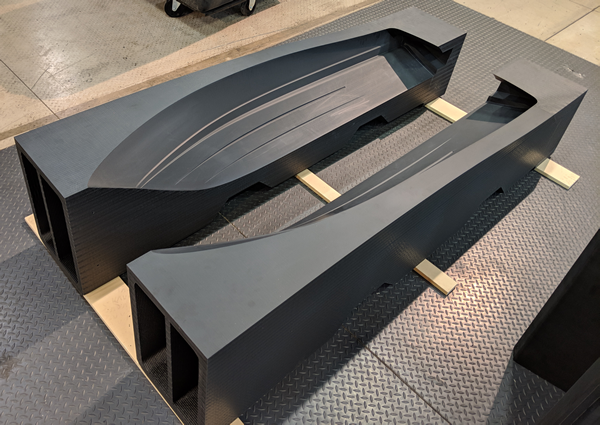 Thermwood has already 3D printed a full size pattern which was used to produce production sport boat hull molds. Much larger vessels, yachts for example, require a different approach. In these instances, it is desirable to print the mold itself rather than print a plug or pattern from which a mold is made. 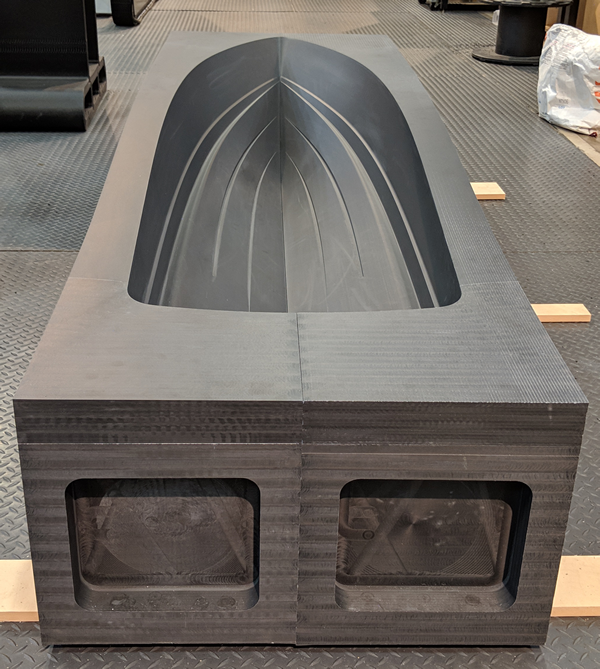 Working with an undisclosed marine industry collaborator, Thermwood has printed a scale model of such a hull mold to test and validate the process. 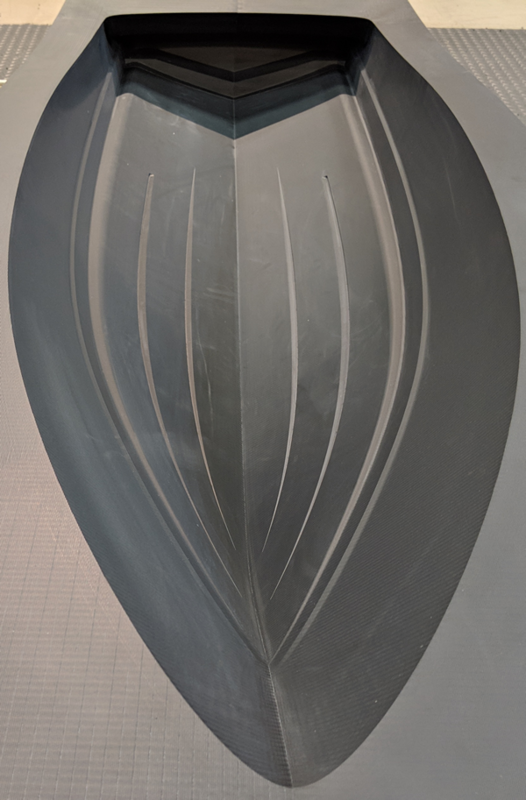 The 1/7th scale test mold for this project is approximately seven feet long (the full size hull is approximately 50 foot). It was printed from 20% carbon fiber filled ABS using Thermwood’s LSAM additive manufacturing machine. 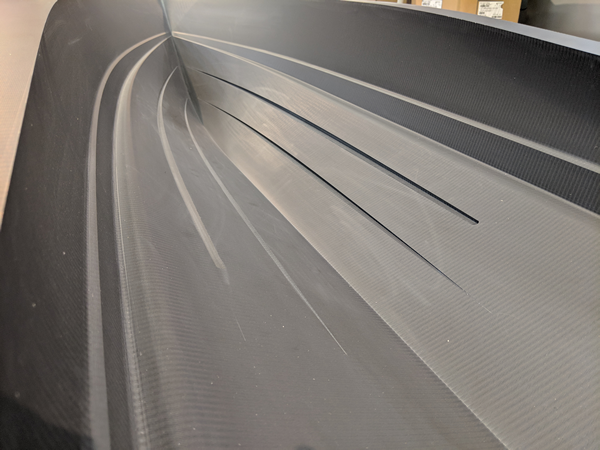 Six separate pieces of different lengths, the longest two, each being over seven feet long, were printed concurrently using LSAM’s Vertical Layer Print capability. Printing required about 30 1/2 hours. The ability to simultaneously print multiple parts of variable heights highlights the flexibility of both the vertical print process as well as Thermwood’s LSAM Print3D slicing software. The parts were then trimmed on the same machine and assembled into two mold halves. The tool includes a deep undercut at the transom, so the finished mold needs to be two pieces, split down the middle. These mold halves are clamped together for layup and then separated to remove the finished hull after curing. 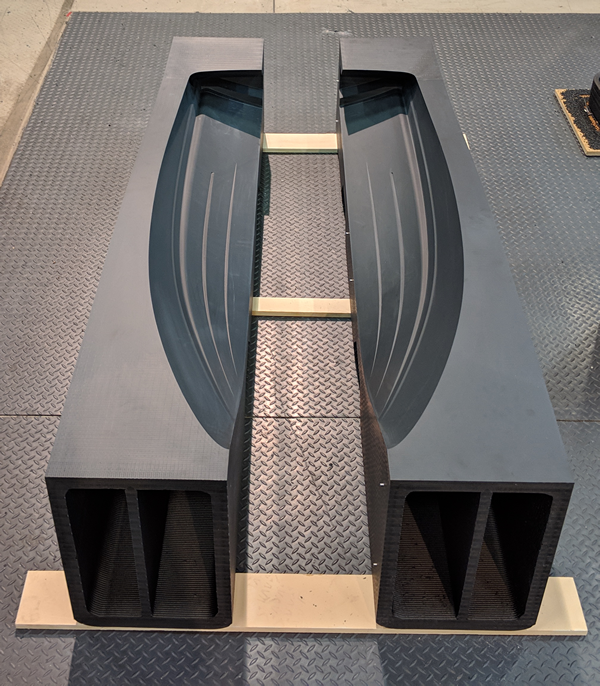 Molds for hulls of longer than fifty feet will be printed in multiple sections, assembled for hull layup and then disassembled to remove the finished part. The test tool printed here simulates that assembly and disassembly process. The tool printed in this program will be tested using production materials in a production environment. Thermwood continues to work on methods and techniques needed to refine this into a production ready process. 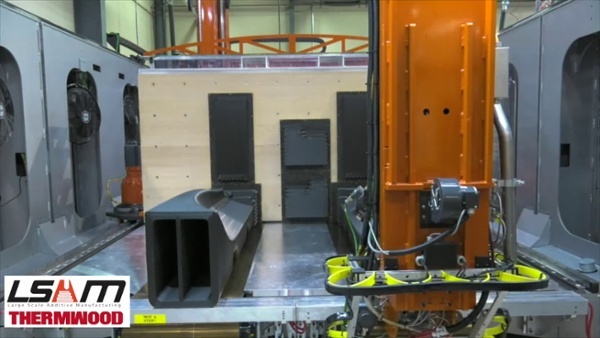 Thermwood believes that the marine industry will benefit significantly from emerging large scale additive manufacturing technology and that this project is a significant first step toward the direct production of large vessel tooling. Much of the technology used in Thermwood’s LSAM machines and print process is completely new. Thermwood has already received numerous patents on these revolutionary developments and many more are in the works. In addition to the projects already announced, many other exciting results that LSAM has already achieved are covered by non-disclosure agreements and must be kept secret. LSAM is truly state-of-the-art in the exciting new world of large scale additive manufacturing.